WHAT MAKES OUR CUSTOM DENTURES BETTER THAN TRADITIONAL DENTURES? At Advanced Prosthodontic and Implant dentistry in Morristown, NJ we customize our dentures so that they will match your unique smile and bite, let you speak and chew comfortably, and improve your appearance and self-confidence. Dr. Barry A. Kaplan, a dentist with over 25 years of experience offers both partial and full custom dentures out of his Morristown office, combining advanced dental technology with custom prosthetics for the best possible fit, stability, and lifelike appearance. They will allow you to eat most of the foods you love, and eliminate the risk of embarrassment, ultimately helping you feel better about yourself, and your smile. We offer lifelike, premium acrylic teeth which utilize a 3-layered tooth structure for a beautiful smile and a natural look. The teeth in the denture are available in multiple shapes, sizes, and shades of white, so you won’t get the “ stamped out- false teeth look” which is so common with standard dentures. The tissue color of the our denture is matched to your existing gums and facial complexion. Dr. Barry A. Kaplan’s dentures appear more natural because they are custom designed and handcrafted to compliment your personality, age, gender, and physical appearance. Looking closely at someone with a beautiful smile and straight teeth, one will notice that each tooth is not precisely aligned with its neighboring tooth. Instead, the placement of the teeth varies slightly to create a unique, beautiful and natural smile line. At Advanced Cosmetic and Implant Dentistry in Morristown, NJ the teeth are individually hand set to insure this occurs. When your teeth (natural or false), are the proper height, the lower portion of your face is lengthened, for a youthful, natural appearance. This avoids the “collapsed” appearance caused by missing teeth or ill-fitting plates. Dr. Barry A. Kaplan’s in-office dental laboratory in Morristown, NJ truly sets him apart, allowing him to custom design and craft his dentures to the very highest standards. He uses custom-molded impressions, precisely anatomically correct, to individualize treatment. His dentures are injection-molded and heat and pressure-cured, which reduces the sizes of the pores in the material. This allows for improved polishing of the denture, which results in less staining and less opportunity for bacteria and plaque to grow, making the denture more odor-resistant. His denture technicians are highly trained and experienced. They work on each case individually with a specific and detailed prescription from the doctor. We utilize State-of-the-Art, premium materials which are the lightest weight and most durable available, resulting in higher-impact strength and longer life. Your comfort is our priority . If you’ve lost some or all of your natural teeth, don’t lose heart. With our dentures, patients from Morristown, Mendham, Randolph and surrounding Essex County communities can restore their smile and regain their confidence. When you come in to our Morristown office for your consultation, Dr. Barry A. Kaplan will determine what your needs are and recommend which tooth shades, sizes and materials are right for you. Call us today to set up your appointment. Mass produced or “stock” dentures are secured to the gums with adhesives. Many dental clinics and discount dental offices provide traditional dentures that are mass produced with little customization using stock budget teeth. This can result in dentures that are uncomfortable, impede speaking, eating and tasting, and can even negatively affect the shape of your face and natural appearance of your smile. Little attention is paid to how the teeth come together which, if not done properly, can cause premature loosening of the denture during speaking and eating. Dr Kaplan customizes his dentures so that they will match your unique smile and bite, let you speak and chew comfortably, and improve your appearance and self-confidence. Dr. Barry A. Kaplan, a Prosthdontist dentist with 30 years of experience offers both partial and full custom dentures, combining advanced dental technology with custom teeth for the best possible fit, stability, and lifelike appearance. They will allow you to eat most of the foods you love, and eliminate the risk of embarrassment, ultimately helping you feel better about yourself, and your smile. We offer lifelike, premium acrylic teeth which utilize a 3-layered tooth structure for a beautiful smile and a natural look. The teeth in the denture are available in multiple shapes, sizes, and shades of white, so you won’t get the “ stamped out- false teeth look” which is so common with standard dentures. The tissue color of the our denture is matched to your existing gums and facial complexion. Dr. Kaplan’s dentures appear more natural because they are custom designed and handcrafted to compliment your personality, age, gender, and physical appearance. Looking closely at someone with a beautiful smile and straight teeth, one will notice that each tooth is not precisely aligned with its neighboring tooth. Instead, the placement of the teeth varies slightly to create a unique, beautiful and natural smile line. Dr Kaplan’s dentures are individually hand set to insure that this occurs. When your teeth (natural or false), are the proper height, the lower portion of your face is lengthened, for a youthful, natural appearance. This avoids the “collapsed” appearance caused by missing teeth or ill-fitting plates. Dr. Kaplan’s State of the Art in-office dental laboratory truly sets him apart, allowing him to custom design and craft his dentures to the very highest standards. He uses custom-molded impressions, precisely anatomically correct, to individualize treatment. His dentures are injection-molded and heat and pressure-cured, which reduces the sizes of the pores in the material. This allows for improved polishing of the denture, which results in less staining and less opportunity for bacteria and plaque to grow, making the denture more odor-resistant. His denture technicians are highly trained and experienced. They work on each case individually with a specific and detailed prescription from the doctor. Years ago, the word “dentures” conjured up images of sticky adhesive pastes and awkward chewing. Our dentures stay in place so you may chew and speak with confidence. We utilize State-of-the-Art, premium materials which are the lightest weight and most durable available, resulting in higher-impact strength and longer life. Your comfort is our priority. If you’ve lost some or all of your natural teeth, don’t lose heart. With our dentures, patients from Morristown, Mendham and Randolph as well as surrounding Morris County communities can restore their smile and regain their confidence. When you come in to our Morristown office for your consultation, Dr. Kaplan will determine what your needs are and recommend which tooth shades, sizes and materials are right for you. Call us today to set up your appointment. WHAT ARE THE TYPES OF COMPLETE DENTURES? Implant-retained dentures provide an advanced alternative to traditional denture placement, as they are secured in the mouth using titanium implant posts, providing greater strength and stability for the replacement teeth. This technique allows patients with dentures to easily speak and eat without worrying about their dentures slipping out of place. Implants help dentures function just like the patient’s natural teeth. Implant dentures help to preserve bone height and gum tissues. When the bone is preserved, relines are less likely since the denture does not have to continually be remolded to the shrinking gum and bones. CAN YOU REPLACE MY TEETH IN JUST ONE DAY WITH ALL ON 4 TECHNOLOGY? Our All on 4 technology makes tooth replacement possible in just one day! By strategically placing 4 dental implants into your jaw bone, Dr. Kaplan can then secure custom dentures to these implants to give you an almost immediate new set of teeth. Because they are supported by dental implants, the All on Four dentures function like healthy, natural teeth allowing you to eat and speak naturally. Dr. Barry A. Kaplan, a certified Prosthodontist and Implant Surgeon, is one of the 3% of Dentists in the United States at the forefront of dental technology using Computer guided Implant Surgery. This has revolutionized dental implant diagnosis and treatment. WILL I EVER BE WITHOUT TEETH WHILE GOING THROUGH THE DENTURE PROCESS? At Morristown Prosthodontics and Implant Dentistry we offer Immediate Dentures (also called Temporary Dentures). These are made in advance and immediately placed after the teeth are removed, thus preventing the patient from having to be without teeth during the healing process. Once the tissues shrink and heal, adjustments will have to be made and/or a new permanent denture is fabricated and the temporary dentures can be used as spare denture. HOW ARE OUR PREMIUM CUSTOM DENTURES DESIGNED? At Morristown Prosthodontics and Implant Dentistry, our world class in-office dental laboratory truly sets us apart, allowing us to custom design and craft our dentures to the very highest standards. The process of getting dentures requires several appointments, usually over several weeks. Dentures are made using your mouth as a model. First, Dr. Kaplan will take an accurate custom molded impression of the upper and lower arches of your mouth. In addition, measurements are made to show how your jaws relate to one another and how much space is between them (bite relationship). He will also help you select the shape and color of the denture teeth and gums. Dr. Kaplan puts an emphasis on creating a final denture that looks like natural teeth…. NOT denture teeth. Differences in texture, whiteness shading, opalescence, size, rotation, are used to eliminate the appearance of mass produced denture teeth. The color of everyone’s gums varies. To make a more natural denture the Dr. Kaplan will help you choose the shade that best matches your mouth and have it custom stained to look like natural gum tissue. The impression, bite and shade are sent to a custom dental laboratory. The dental laboratory makes a mold or model of your jaw, places the teeth in a wax base, and carves the wax to the exact form wanted in the finished denture. In the subsequent visits, Dr. Kaplan will adjust your bite, test your speech and check the appearance and functionality of the denture teeth and gums. Dr. Kaplan goes to great lengths to ensure your custom dentures are accurate in measurements and appearance so that they are comfortable, functional and compliment your face. The denture is then sent back to the laboratory for fabrication. At the final appointment, Dr. Kaplan will precisely adjust and place the completed denture for a natural and comfortable fit. Upon receiving your new dentures, you will be given instructions from Dr. Kaplan on how to care for them. Proper cleaning of your new dental appliance, good oral hygiene, and regular dental visits will aid in the life of your new dentures. Broken, cracked, decayed or missing teeth can cause health problems throughout your body. Therefore, these non restorable teeth should be removed and replaced with full or partial dentures as soon as possible. There is increasing evidence that poor oral health is directly linked to a number of chronic health conditions, including diabetes, heart disease, stroke, and complications during pregnancy. Dentures can provide support for the lips and cheeks helping prevent the face from sagging. Missing teeth can destroy the aesthetics of your smile. Dentures will enhance your smile and boost your confidence. To improve a patient’s speech, chewing, and digestion. Dentures are an easy, affordable and convenient alternative to dental implants. Partial Dentures can prevent teeth misalignment caused by teeth drifting out of place . A Complete denture may be either “conventional” or “immediate.” Immediate dentures (also called temporary dentures) are made in advance and immediately placed after the teeth are removed, thus preventing the patient from having to be without teeth during the healing process. Once the tissues shrink and heal, adjustments will have to be made. Then new permanent denture is fabricated and the temporary denture can be used as spare denture. A Conventional Denture is made after the teeth have been removed for a year and all the tissues have shrunk and healed. A replacement denture is also called and Conventional Denture. 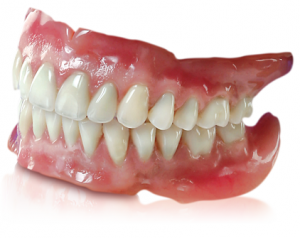 WHAT IS AN OVER DENTURE? Overdentures use one or more of your remaining teeth for support. The advantage of this type is greater stability when chewing. The denture is often secured with snaps. Nearly any patient that is missing some or all of their teeth is a good candidate for at least one of the types of dentures available at our Morristown Dental Office. Dr. Kaplan along with his highly trained and educated office support team will be happy to answer any questions you have while exploring the best dentures for you. The freedom and improved confidence that come from the decision to be fitted with a set of custom dentures can truly be life-changing. WILL MY DENTURES LOOK AND ACT LIKE REAL TEETH? Your dentures are going to look and act just like real teeth. Dr. Kaplan custom crafts them with the highest quality premium teeth and custom gum shading so that they will look absolutely natural. You can now smile and eat without feeling self-aware or embarrassed. HOW WILL MY NEW DENTURES FEEL? After the placement of your dentures, you may experience some soreness. It may require a few adjustment visits. Adjusting to your new dentures is a process, however, your mouth will eventually become accustomed to wearing it. You may have an increase in Saliva for several weeks after the dentures are placed. This is a natural response. CAN I WEAR MY DENTURES ALL DAY? Dentures should be removed from the mouth for a period of time each day. Wearing your dentures for 24 hours a day creates a dark damp environment that is well suited for growing bacteria and fungus. When your denture is out of your mouth and not being soaked in a cleaner it should be stored in water to prevent it from warping. WILL IT BE DIFFICULT TO INSERT MY NEW DENTURES? Inserting and removing the denture will require some practice. Your denture should easily fit into place. Never force the partial denture into position by biting down. This could bend or break the clasps. It is normal to have some difficulty chewing when your dentures are first placed. This is normal and will subside as your mouth adjusts to the dentures. Start out by eating soft foods that are cut into small pieces. Chew your food slowly using both sides of your mouth to keep even pressure on the denture. Avoid sticky or hard foods, including gum. As you become accustomed to chewing, add other foods and gradually resume your normal diet. Your mouth will need to adjust to the placement of your new dentures. It is normal to experience some speaking issues while getting used to your new dentures. IS IT NORMAL TO EXPERIENCE INCREASED SALIVA FLOW WHEN YOU FIRST START WEARING YOUR NEW DENTURES? Yes, it is. However this will subside as your muscles and tissues get used to the new dentures. In order to ensure that your dentures last a long time, you will need to be very diligent in the way you care for them. Dentures are inherently porous, they will trap and harbor bacteria and even put you at greater risk of fungal infections. When bacteria are allowed to accumulate and grow on the inside of the denture, it poses a health risk to the patient. Studies show that bacteria inside a denture have been correlated with heart infections, Respiratory infections and lung infections. Often times the patients mouth will become fiery red and extremely sore, indicative of a fungal infection. Denture home care is therefore centered around keeping the inside of your denture as clean as possible. Most patients soak their denture in a denture cleaner however, the inside of the denture should be scrubbed with a soft denture brush and a denture tooth paste. Care must be taken not to use a brush that is too abrasive because an abrasive brush will scratch the inside surface and bacteria can more easily attach to the denture increasing your chance of infection. Only special denture toothpastes should be used because regular toothpastes are too abrasive and will also scratch the surface. Although denture soaking tablets kill bacteria they do not kill fungal infections therefore, your denture can be soaked periodically in bleach but for NOT MORE THAN 10 MINUTES!! Bleach will kill fungal infections. Remember to thoroughly rinse you denture after soaking it with a cleaning/disinfecting agent. Even with full dentures, you still need to take good care of your mouth. Every morning you should brush your gums, tongue and palate with a soft-bristled brush before you put in your dentures. This removes plaque and stimulates circulation in the mouth. Selecting a balanced diet for proper nutrition is also important for maintaining a healthy mouth. Pay special attention to cleaning teeth that fit under the dentures metal clasps. Plaque that becomes trapped under the clasps will increase the risk of tooth decay. Denture adhesives are acceptable to make well-fitting dentures fit better. They are usually affective for several hours but not more. Adhesives are not a way to make ill-fitting dentures fit better. This is because more and more adhesive will be needed as your mouth changes. Some adhesives have Zinc and if a lot of adhesive is being used, the Zinc and copper balance in your body will be disrupted possibly causing neurologic side effects. If you use denture adhesive the old adhesive should be thoroughly removed before applying the new paste. This is important because old adhesive will harbor bacteria. WHEN ARE DENTURE ADJUSTMENTS, RELINES OR REPLACEMENTS NECESSARY? If your denture is not fitting well, it may need to be relined, adjusted or remade. As you age, your mouth naturally changes, which can affect the fit of the denture. Bone and gum ridges can recede or shrink, causing jaws to align differently. Shrinking ridges can cause dentures to fit less securely. This is why implants are so important, because they can prevent further bone changes. 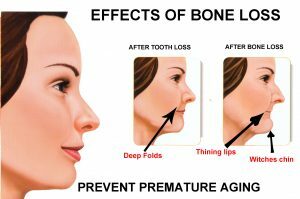 Dentures that do not fit well will cause greater bone loss because as your mouth changes the dentures sit differently in your mouth and the bite is no longer correct. When the bite is not correct, it puts unfavorable pressure on the bone underneath causing it to “dissolve away”. Also, when the bite is not correct, it will make it likely that you might knock a tooth off your denture if you are biting more heavily in one area. Loose dentures can cause various problems, including sores, infections, chewing difficulty and may change your facial features. WHAT IF MY DENTURE NEEDS TO BE REPAIRED? Contact Dr. Kaplan immediately, if your dentures break, crack, chip, or if one of the teeth becomes loose. Dr. Kaplan can often make the necessary adjustments or repairs on the same day. We handle all denture adjustments, relines and repairs in our state of the art in office lab. Dr. Kaplan will advise you about how often to schedule check-up appointments. Dr. Kaplan will want to continue to make sure that your dentures continue to fit properly and make any required adjustments, repairs or relines.